The American Spirit Mustang travels the United States in efforts to raise awareness and money for Veteran needs. Request an appearance of The American Spirit Mustang to visit your next event! Support the VFW with the purchase of a Diecast metal replica of The American Spirit Mustang! Get the latest news and see what's coming up next for the American Spirit Mustang. Check out photos from past events and view some of our favorite videos. On this page you will find tributes to American heroes who served in our military. The American Spirit Mustang has toured the States since 2010 to help educate, inspire and remember the sacrifices that were made to create and maintain our Country. Learn more about the mustang and how you can help. Check out the November 2017 issue of AutoUrge Magazine. 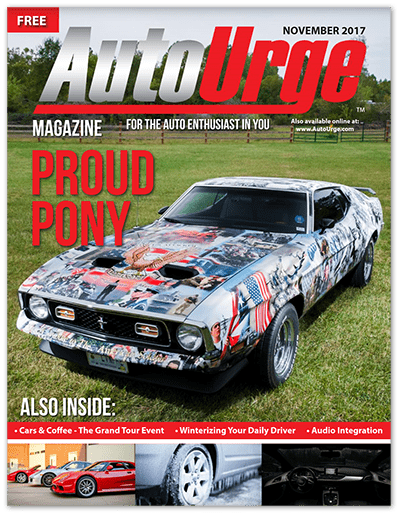 Ron Tucker wrote a great article on the American Spirit Mustang. He tells you a little more history on the car and the photos taken by Ryan Ledesma are simply amazing. Thank you AutoUrge for featuring us in your magazine! Win your very own American Spirit Mustang!